Eagle Eye Care is your on-campus vision care resource open to students, faculty/staff and retirees. Our highly-qualified staff provides comprehensive eye care services using state-of-the-art equipment. We carry name-brand frames, contact lenses and sunglasses — all at low prices! And, we offer courtesy adjustments and repair to glasses. 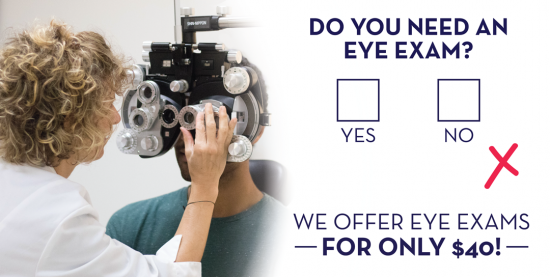 Schedule an appointment with our optometrist today! You’ll find our office on the first floor of Health Services at the corner of Plant Dr. and Chandler Rd. Designer lenses and frames from Nike, Jack Spade, Kate Spade, Fossil, Ray Ban, Vera Bradley, Nine West, Jessica Simpson, Michael Kors, and more. Designer sunglasses from RayBan, Costa Del Mar, Oakley, Kate Spade, and more.